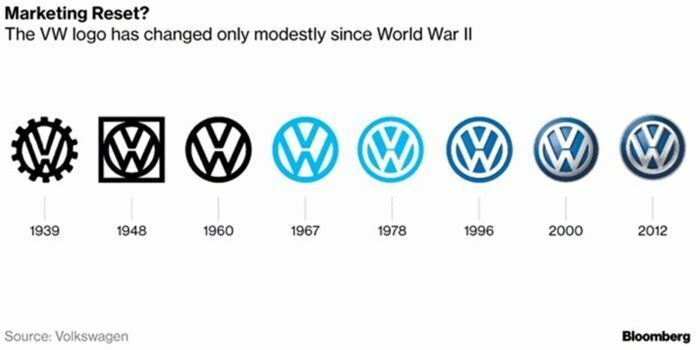 For the first time in six years, Volkswagen will tweak its famous – and quite noticeable – intertwined brand logo. The reasons for the changes are twofold: 1. The automaker is preparing for its dive into the electric car era; and 2. VW is trying to clean up its image following the Dieselgate cheating scandal. Jochen Sengpiehl, VW’s chief marking officer, told reporters this week at a press briefing, that plans call for the unveiling of the new brand logo next year, just in time for the start of the automaker’s aggressive rollout its electric vehicles. The new logo is designed to work not only on electronic devices such as smartphones and vehicle screens but also in its car-mounted role. The new logo sports a more three-dimensional look. Overall, the logo has changed very little since its resurrection after World War II. Frankly, Sengpiehl told reporters,“The brand is not in good shape, compared to previous years." The marque, he maintained, lost some of its appeal by trying to be "too German." The change results from more than just the "diesel scandal." VW plans a full-court press to put more members of a skeptical public behind the wheels of electric vehicles. To that end, the automaker will make full use of digital and social media to hone its message. They believe that a fresh-looking logo is one key to freshening the brand’s image as the marketing people show that the automaker is making good on its $25 billion electric car promise. VW’s marketing approach is to be more approachable, not as stiff, while it also highlights the innovative electric vehicles they will be marketing. Equally as important, the automaker is trying to justify the higher-priced electric cars they will be selling, said Sengpiehl, a veteran of Hyundai. Today, the average cost of a battery-car is between $7,500 and $12,000, numbers that could change as technology changes and adds to EVs in the next few years. Meantime, VW is hoping to be more proactive in its response. The automaker is planning to create regional hubs so it can tailor its messages more quickly as it reacts to market changes. Meantime, the automaker is in gear and trying to pull away from Dieselgate, VW’s self-inflicted emissions scandal. Newly-minted CEO Herbert Diess oversees and will continue to operate VW, the 12-brand group which is also the focal point of the automaker's big rollout of electric cars. The implementation begins in two years with the all-electric I.D. hatch. Following the hatchback, VW will roll out the I.D. Crozz, sports-ute, in 2022 followed by the I.D. Buzz, an MPV, whose iconic looks hearken to the VW Microbus of the 1960s and 70s. A sedan is set to join the I.D. lineup in the same timeframe. “The big challenge is: How do we get people into the electric world,” Sengpiehl asked. “We want people to have fun with us. We need to get more colorful.” One way to do that, of course, is through the logo.